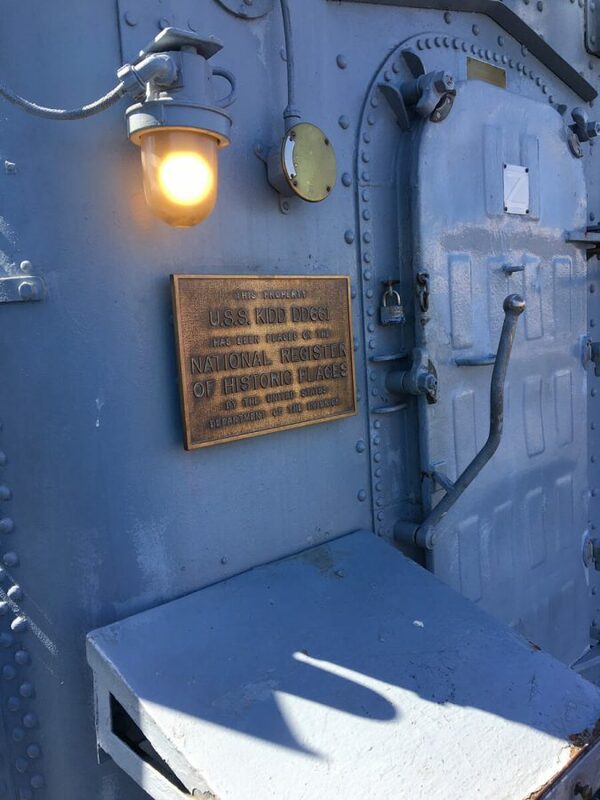 Welcome to the official Internet home port of the Fletcher-class destroyer USS KIDD (DD-661) and the USS Kidd Veterans Museum. Located in the heart of scenic downtown Baton Rouge, Louisiana, she is the centerpiece of a memorial which serves to honor the men and women of our American armed forces. Through our exhibits, take a step back in time and learn about their sacrifices for the freedoms we enjoy today. 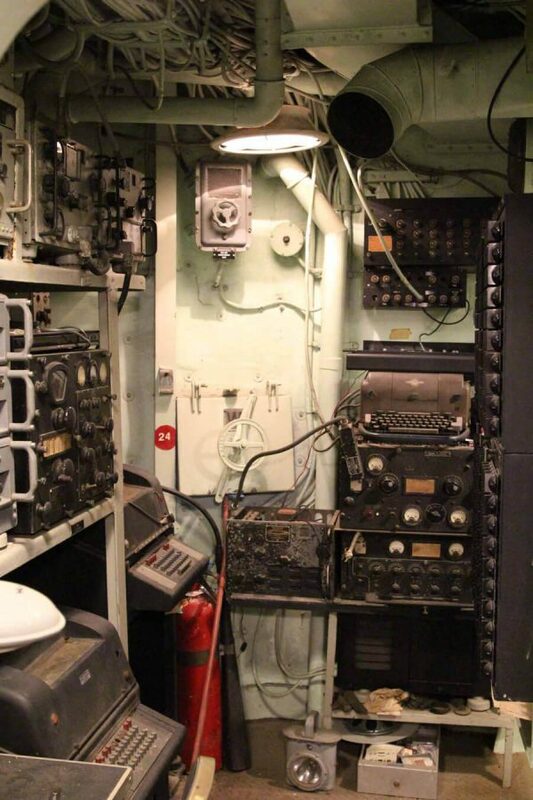 We encourage you to come to Baton Rouge and walk the decks of the Kidd in person, as she is restored to her original WWII configuration. See the aircraft that soared through the skies of Southeast Asia during two eras of conflict. Examine the dented helmet of an infantryman who stormed the beaches of Normandy. Touch the names of the fallen Americans whose names are carved into the black granite walls of the Louisiana Memorial Plaza. We promise you: you won’t be the same afterward. We exist to preserve history, educate our community, and serve the veterans who sacrificed for our freedom. We need your help. Your support is crucial to helping us continue to execute this mission. There are many ways that anyone can help. Time, money, resources, skills, and participation all help us get the word out so more people can visit our museum and learn about life aboard the Kidd. Read on to see which method(s) of support are right for you. Even if you can’t donate, tell your friends and family about our worthwhile site along the banks of the Mississippi River in beautiful downtown Baton Rouge. Your financial support enables our quest to preserve an American icon and community platform. 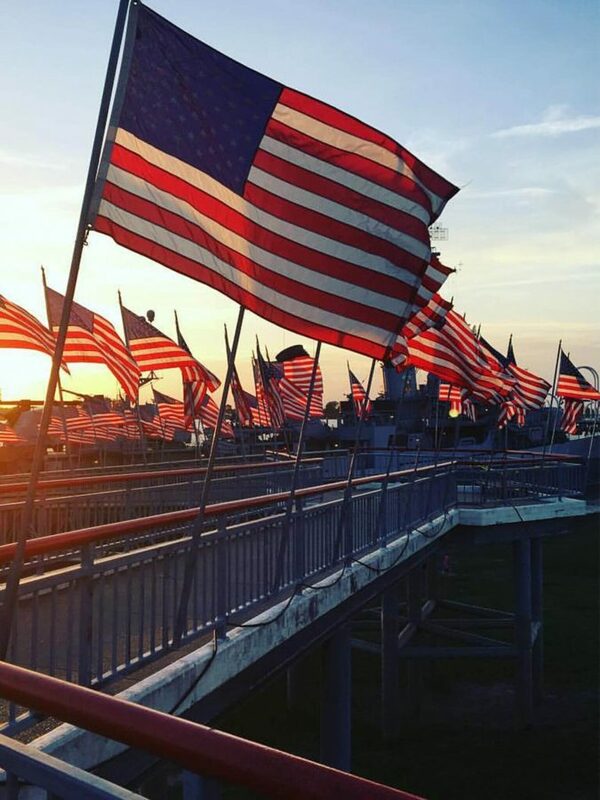 Let us give your business a platform to support veterans and educate the public. Volunteers augment our small staff and make many programs and events possible. Employment Opportunities: Interested in working on the USS Kidd? A limited number of employment opportunities are available in the various departments of our operations. If you’re interested in committing a significant amount of time to working with us, please fill out and return our employment application. We’ll be in touch! The USS Kidd Veterans Museum exists as a nonprofit entity receiving no government funds. 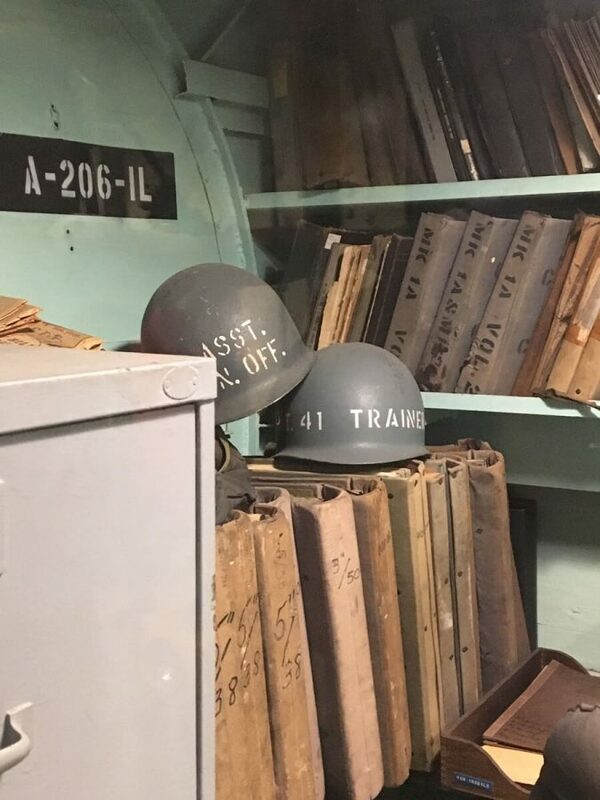 Existing as a ‘friends” group, the Louisiana Veterans Museum Foundation supports the operations and programs of the museum and ship restoration. Donations made to the Foundation and Museum are tax deductible contributions. David’s first career was as an underwater archaeologist (That’s right, he’s Aquaman-meets-Indiana Jones! ), but the ocean depths proved to be too tame. So, he transitioned to the fact-paced, high-octane field of museum work. He has over 20 years of experience in curating and administrating museum collections of everything from classic cars to historic ships and submarines. Recruited in 2016 to help plot a new course to revitalize the museum, make it relevant to today’s society, and help develop the strategies to fund it, he spends his days working to forge partnerships throughout the Baton Rouge community toward that end. David prides himself on the ability to provide arcane pop culture knowledge and references at a moment’s notice. Trained as an educator at LSU, Tim started out at the USS KIDD in 1995 as a part-time tour guide and worked his way up the ranks. Described by some as a “walking encyclopedia of military history,” and no doubt a black ops comedian, he brings to the table over two decades of museum, tourism, and hospitality experience in the Baton Rouge area. Denied careers as a jockey and a Top Gun pilot, he works to ensure KIDD survives beyond the next century while honing his Force skills to become either a Jedi Knight or a Sith Lord (the jury’s still out). We warn you not to underestimate his abilities. Living history interpreter. Drone pilot. Speaker of five languages. All-around foodie and renaissance man. These are just a few of the things that describe Andrew Daire. He started out at the KIDD as a tour guide and now he manages the care and cataloging of the many rare objects found in the museum’s collection and helps build exhibits to display and interpret them. When not in the depths of the museum vault, Andrew can be found on drill with the National Guard or lying prone on the ground as an early casualty in reenactments at Port Hudson (ignore the snoring coming from the “dead” infantryman). He likes his coffee black and his storage boxes and sheet protectors acid-free. Starting out as a volunteer and graduating to staff member, Hank is a jack-of-all-trades. He learned all-around general maintenance growing up on a dairy farm and studied architectural engineering while embarking on a career in iron work and later collision repair. If you look around the Baton Rouge or New Orleans landscape, Hank had a hand in building some of it. He’s now turned that expertise into helping keep a National Historic Landmark afloat for the long-term goal of 100+ years. If you hear his phone playing heavy metal music, though, … turn around, quickly walk away, and throw in a few zigs and zags. The Louisiana War Memorial Commission was established by the State of Louisiana to manage the ship and museum. This oversight ensures ethical, legal, and compliant operations are carried out at all times. The Historic Naval Ship Association is a world-renowned organization with 188 unique and timeless ships in their fleet. Their mission is to support the preservation of historic naval vessels and to honor those who have served at sea in defense of their nations. We are honored to be awarded by this prestigious group. Radarman 2nd Class Wallace B. “Mac” Mackensen is a Cold War veteran who began volunteering aboard KIDD in 2003. He earned HNSA’s distinguished Bos’n Marvin Curry Award for exceptional service in the areas of interpretation, maintenance, preservation, and restoration. Only one of these awards is issued annually. This marks the third year in a row that a KIDD volunteer has received this honor: Garrett Lynch in 2014, Frank “Beef” Lewis in 2015, and Mackensen in 2016. Boatswain’s Mate 2nd Class Henry J. “Hank” Taddeucci is also a Cold War veteran who served aboard USS KIDD in 1961-62. He has volunteered aboard his old ship via the museum’s Field Day program since 2005. He earned HNSA’s Maintenance/Preservation/Exhibition Award for exemplary work in those areas over a long period on a part-time basis. 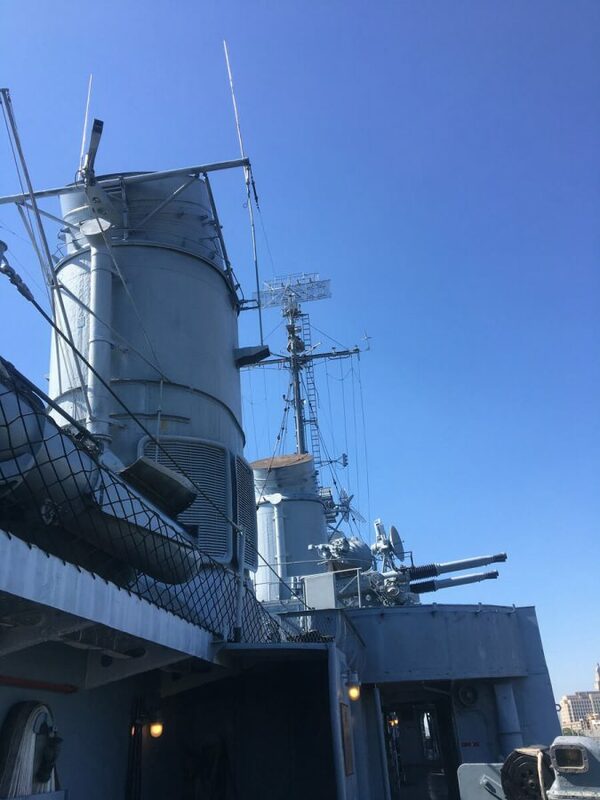 Taddeucci travels regularly from Colorado each October to help repair and replace ropework along the decks of his old destroyer. KIDD volunteers have also been among those receiving this honor for the past three years: George Seal in 2014, Richard Ammon in 2015, and Taddeucci in 2016. Former KIDD Executive Director Alejandra “Alex” Juan earned HNSA’s William J. Difley Award which honors departing directors of HNSA Fleet Member organizations who have contributed in some great measure to the success of their museums. From December 2013 to May 2016, Juan successfully steered the museum through a difficult financial period and a state investigation. New programming initiated under her tenure garnered international attention from as far away as India and an 86% increase in attendance in 2015. Ship Superintendent & Educational Outreach Coordinator Tim NesSmith has worked at the USS KIDD since 1995, starting out as a part-time tour guide. He advanced through the ranks to his current position where he guides the ship’s restoration and the museum’s educational efforts. He earned HNSA’s Educator Award for performance at a superior level in furthering the museum’s education program. He was further honored by his peers in HNSA with the Old Walrus Award, given for demonstrated knowledge of the Historic Naval Ship Fleet and cooperation and assistance with other fleet members. McKinney Fleet & Barge Services and KIDD Volunteer Richard Ammon were presented with international-level awards from the Historic Naval Ships Association (HNSA) during a Fall Field Day banquet held at the USS KIDD Veterans Museum on Oct. 23. HNSA’s Casper J. Knight Award was presented to McKinney Fleet & Barge Services for contributing in a major way to the preservation and exhibition of a historic naval ship over a considerable length of time. The family-owned company has been involved with some of the KIDD’s largest special events and restoration projects over the years. The in-kind services they’ve provided have saved KIDD a significant amount of money. HNSA’s Maintenance/Preservation/Exhibition Award was presented to Boiler Tender 1st Class Richard Ammon, Jr., a Cold War veteran, for his exemplary work in those areas over a long period on a part-time basis. Ammon, a long-time resident of Winter Park, Fla., served aboard the KIDD when she was in service and has volunteered for his old ship since 1990. KIDD volunteers have received this award two years in a row: George Seal in 2014 and now Ammon in 2015. Ammon and the McKinney family received two of five awards garnered by KIDD staff, volunteers and supporters in recent weeks; four from the Historic Naval Ships Association and one from the Louisiana Association of Museums. USS KIDD Ship Superintendent Tim NesSmith presented Frank “Beef” Lewis with the Historic Naval Ships Association’s Bos’un Marvin Curry Award on the ship’s gangway on Sept. 24. NesSmith nominated “Beef” for the prestigious Bos’un Marvin Curry Award which is given to a museum vessel volunteer or staff member for exceptional service in the areas of interpretation, maintenance, preservation, and restoration. Preference is given to non-salaried employees and volunteers consistently demonstrating competency in their field, a commitment to excellence, and a strong love for their vessel. Lewis, a Korean War veteran and retired engineer, has been volunteering aboard KIDD since 1997. USS KIDD Ship Superintendent Tim NesSmith was presented with the Historic Naval Ships Association’s Henry A. Vadnais, Jr. Award for outstanding service on the decks of his beloved ship on Monday, Sept. 21, 2015. NesSmith has been a dedicated member of the KIDD Crew for over 20 years. He started out as a part-time tour guide in 1995 and worked his way up the ranks where he currently serves in the prestigious capacity of both Ship Superintendent and Educational Outreach Coordinator. The Henry A. Vadnais, Jr. Award is awarded to a staff person at a Fleet Member organization for particularly outstanding service rendered to his or her organization. Preference is given to persons working in the areas of curatorship, collections management, exhibits or registration.